Your local video settings are behind the Settings menu - the cog wheel at the top left of the user interface. You can choose your camera, microphone and speaker there. Your local video has buttons on them to influence what you are sending to your peers. Click on the video or audio icon to hide/unhide and mute/unmute yourself. 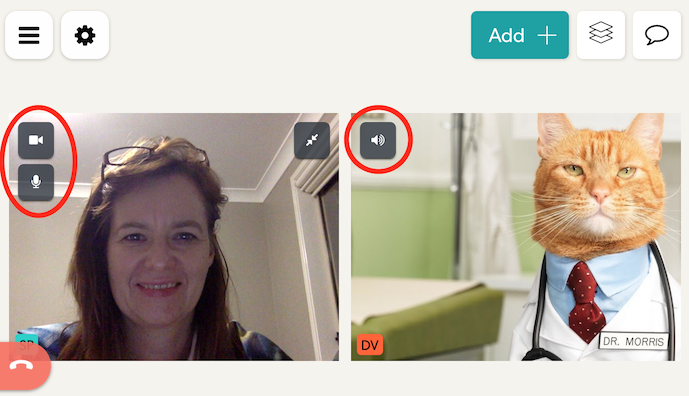 To mute the audio of a peer, click on the camera icon on their video. The below video explains how to turn your local video and audio on/off.